If you’re hosting an outdoor event for your office, you probably need to look for corporate event tents. That's especially true during the fall and winter season, also known as awkward office Christmas party season. You will be faced with a tough decision when deciding between tent renting or buying, but if you think it’s likely you will use it less than three or four times per year, renting is likely the better choice. That said, here are some ideas for turning that corporate shindig from a bore to a score! Tents can be used for a wide range of different types of events, but temporary storage is not a use for a tent that most people think of. However, with winter approaching, keeping your equipment warm, safe and dry can be important. 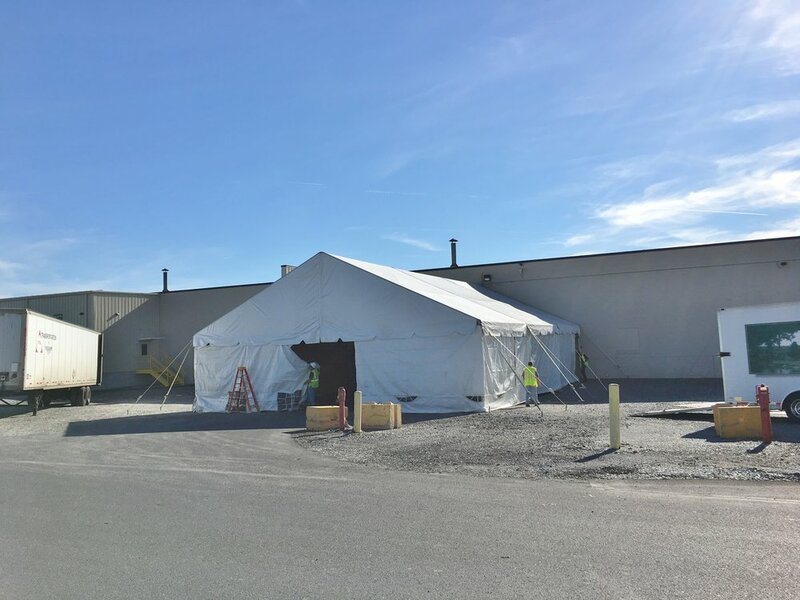 Our industrial tents are great for temporary warehousing, construction projects, manufacturing and much more. If you're looking for something that is semi-permanent, check out our sister company Coverdomes. These fabric buildings are quickly installed, but can be left in place for many years. Contact us today for a fabric structure to meet your needs and your timeframe. Despite the fact that June continues to be the most popular month to get married, more couples are opting for winter weddings. Although this season may have its difficulties, it can also be the most magical and picturesque time to tie the knot. And while you may not want to rent a tent for a wedding in the wintertime, you aren't limited in your celebrations. Here are three trends that will make any winter wedding the talk of the season. The weather is getting colder, but that doesn't mean that your wedding needs to be put on the back burner until the sunny days of spring! According to the Knot, the second most popular month to get married is October, and we believe there are many benefits to getting married during the colder months. Did you know the hottest new experience in Manhattan is a tent? Even though it's cold outside, we're working hard to be sure that your event is safe, secure and beautiful. Can I Rent a Tent in the Winter? This article is part of a series of posts with further explanation on many of our frequently asked questions. Fall is here an winter will be before you know it. Great news, it's not too late to plan an outdoor event. Tents can turn your frosty back yard into a warm, inviting event space. 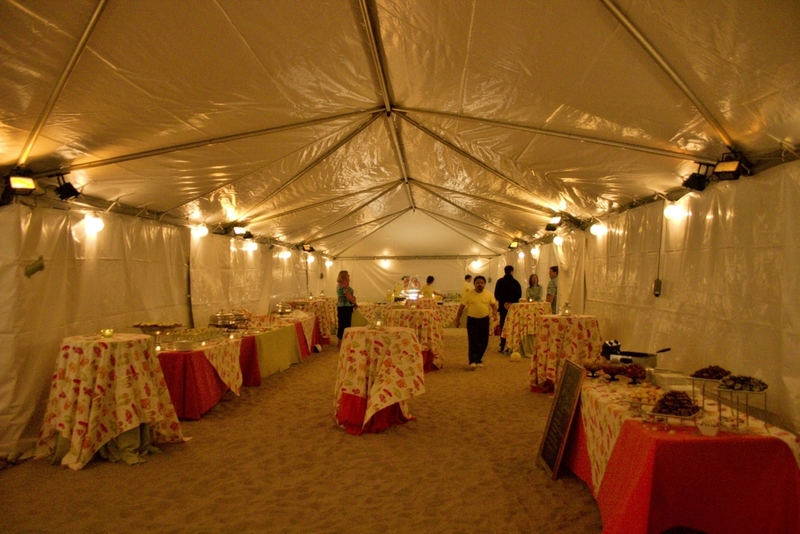 Your next New Year's Eve party could be in a tent. With a little extra planning a winter tent event can be a success. A walkway to the house, building, parking lot, etc. We make it easy for you to plan a winter event. We'll help you plan a solution just for you. Our heaters have automatic thermostats that keep your event warm even when the weather isn't. We have extensive experience with winter tenting for Christmas parties and other special events, car sales, temporary storage and much more. 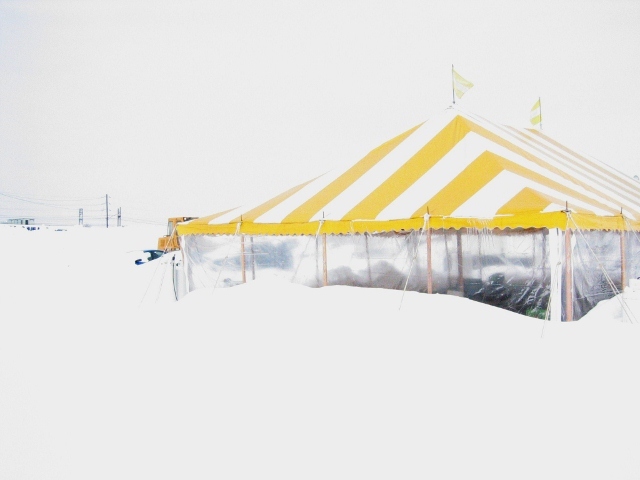 Contact us to fill all your winter tenting needs. What If a Storm Comes While the Tent Is Up? What if the weather doesn't cooperate and there's a severe storm during my event? What is the difference between a frame tent and a pole tent? Many people wonder what the difference is between a frame tent and a pole tent. This article will be a bit more technical than most. So, I'll do my best to make it easy to understand. Pole tents, also known as tension structures are an evolution of the earliest type of tents. The forerunners to modern pole tents were the big top circus tents of the past. They have one or more high peaks in the center. Their structure comes from the fabric itself. They can be installed quickly with no need for beams to support them. Many of today's pole tents are engineered to withstand up to 70 mph sustained winds and 90 mph gusts. Pole tents are the most economical type of tent that we offer. They are great for weddings, backyard parties and other events of all kinds. They have tall, graceful peaks and airy spacious interiors. Many people prefer this style over the more traditional square frame tent appearance. They can be installed on nearly any surface where stakes can be driven into the ground. While pole tents fill the needs of most of our customers, there are some situations where only a frame tent will fit the bill. Frame tents, also known as clearspan structures or clearspan tents offer some unique advantages. Sometimes, tents must be secured with weights instead of driving stakes into the ground. In locations where a driveway cannot be penetrated or where underground utilities make it unsafe to drive stakes, a frame tent with weights is the perfect solution. Frame tents are much more flexible in the ways that they can secured. They can be installed on a deck, patio or even the rooftop of a building. Frame tents have other advantages as well. They have no interior poles. This is great for construction projects where machinery must work inside the tent or events where poles would obstruct the flow of people. Frame tents also work well as weather protection for a stage at a graduation ceremony or other outdoor event with a large audience. Lighting and speakers can be hung from the aluminum beams of the tent. 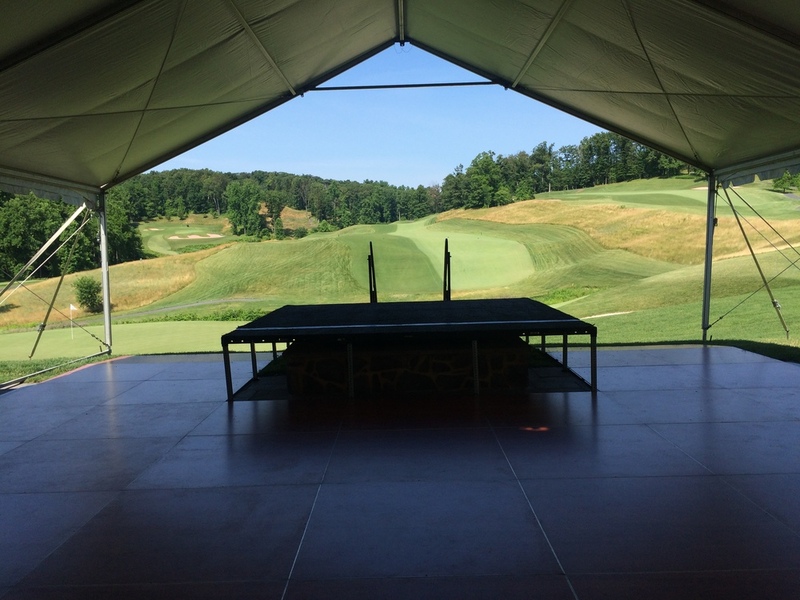 The front of the stage can be completely unobstructed by tent poles. Frame tents can also be easily raised to a taller height to cover a stage or to allow machinery to enter the tent. Some people prefer the more modern, "Euro" appearance of a frame tent. Still not sure which type of tent you'll need? Contact us and let our representatives find the best solution for your event. Whichever type of tent you choose, rest assured that Tents For Rent will provide you with a quality tent and excellent service to make your event successful. Pole tents are perfect for back yard parties and other events. Our "Century" frame tents offer the aesthetics of a pole tent with the advantages of a frame tent. Pole tents, have tall, graceful peaks and elegant curves. Frame tents have a completely unobstructed interior. They can also give a wide open view to the outside as well. Engineered pole tents are designed to withstand all types of weather. Frame tents can be installed in locations where no stakes can be driven into the ground. The design of pole tents makes them very popular for weddings. Frame tents can be staked much more flexibly than pole tents. Can I Keep a Tent Warm in the Fall? But, you may wonder how you will keep your guests comfortable. It may be snowing, but that doesn't mean that you outdoor events can't go on. Our heated tents are up to the task. We've been featured on the One Minute How-To Podcast again. This time we discuss "How to Plan an Outdoor Event in the Winter." Listen and learn what you need to know about heaters, snow and more.